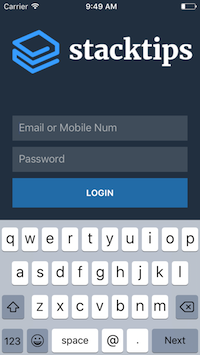 In this article, we will show you how to create a Login Screen using React-Native that will work for both iOS and Android Platform. This example is developed in MacOS. Before you begin, make sure you have all the software prerequisites are installed on your development machine. You need ‘Homebrew’ package management software to get all other dependency packages. Usually all modern macOS are preinstalled with home-brew. By any chance, if you don’t have it on your machine, install it using following command. Learn more from official Homebrew website here. Install node.js if not installed already. To check if it is installed paste the following command in your terminal window. If not installed, the following command will install the latest node version. Now we will install ‘Watchman’. Though it is strictly not required, this will make our development productive. Watchman is a tool by provided by Facebook, used for watching changes in the filesystem. Run the following command to cross check React-native version. Check you have the latest SDK of iOS and Android available in your system.Download and install if you don’t have it already. Make sure you have installed Visual Studio Code IDE, and relevant Plugins for React-Naive. Refer our beginners guide for more information on the Visual Studio Code IDE plugin installation. Now, we are ready to go by creating a new project by name DemoLogin via Terminal or iTerm, where we are using iTerm throughout in this article. Open the Command Palette (⇧⌘P) and type shell command to find the Shell Command: Install ‘code’ command in PATH command. Restart the terminal for the new $PATH value to take effect. You’ll be able to type code . in any folder to start editing files in that folder. Open index.ios.js delete all the code inside render function, and also remove the snippet inside the const styles. Anyways we are going to create everything form scratch. Now let’s create a proper folder structure by creating new folder’s of required components, as of now we need a Login component and logo image to display on login screen src -> components -> images and Login as shown below. Replace 'MyClass' with 'Login' and save the file. Let’s compile and check weather we have zero compilation error and logo image rendering properly as expected. We can compile in two ways one is via iTerm and another via VS Code Editor. To compile via iTerm paste the following command, make sure your inside project folder. Next let’s create a form component for LoginScreen which contains two textfield(Email and Password) and Login Button. Create new file inside Login folder and name it as LoginForm.js and follow the same steps for creating component which we did for Login Component above and type rnc, replace MyClass with LoginForm. 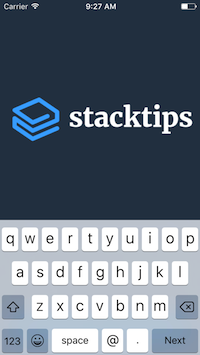 Let’s create a TextFiled’s for Email and Password and a LoginButton, we should import TextInput inside and TouchableOpacity for LoginButton inside react-native. Inside View container tag paste the following snippet, which contains properties for Textfield like keyboardType, returnKeyType, placeholder, placeholderTextColor ,onSubmitEditing, secureTextEntry for secure password. 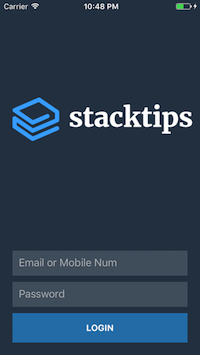 For Login button we can use either react-native Button component or TouchableOpacity, we will use TouchableOpacity in this article. if you want to check in Android we need to copy paste the contents form index.ios.js to index.android.js, that’s it…! this will work as champ..!